Tell us what you think about our utilization management services — you could win a prize! Tell us what you think about BCN Care Management services – You could win a prize! Online provider search — bcbsm.com has an online provider search that allows you to look for affiliated providers by first selecting the member's Blue Cross or BCN product and then viewing the network choices by type of care and location. More detailed searches are possible by clicking on More Search Options. Once you have located the provider, you need to log in to e-referral to submit the referral request using the provider's name or NPI. Referrals to the University of Michigan Health System and Henry Ford Health System — Referrals to these two health systems require using specialty group NPIs rather than referring to an individual practitioner. Referrals to a hospital — When issuing a referral or outpatient authorization for a hospital, referring providers should enter the facility NPI in the e-referral Servicing Facility ID field. Blue Cross and Blue Care Network provide a variety of training opportunities to learn about e-referral. Your provider consultant is available by appointment to visit your office and assist with your e-referral training needs. Note: Please see the Test your e-referral user ID and password flier (PDF) for instructions on how to log in, what to do if your account is not active and how to obtain a user ID and password. To reset your password, contact the Web Support Help Desk at 1-877-258-3932, Monday through Friday, from 8 a.m. to 8 p.m.
To prevent your password from being deactivated, log in to e-referral and complete at least one transaction or activity each month. e-referral Quick Guide (PDF) - A brief overview of what you need to know to start using the e-referral tool. BCN Provider Inquiry Contact Information (PDF) - Provider Inquiry phone and fax numbers for all BCN products. BCN Provider Resource Guide (PDF) - Offers providers easy access to contact information for various BCN services and functions. Each service or function has a dedicated page that is updated as needed, so that the most current information is always available. BCN Provider Resource Guide At a Glance (PDF) - One-page summary of key BCN contact information. The At-a-Glance summary helps providers keep phone and fax numbers at their fingertips and is updated as needed, so that the most current information is always available. Blue Cross Provider Resource Guide At a Glance (PDF) - Two-page summary of key Blue Cross contact information. The At-a-Glance summary helps providers keep phone and fax numbers at their fingertips and is updated as needed, so that the most current information is always available. Blue Care Network Member ID Cards (PDF) - Brochure with BCN product information for providers, including images of the various member ID cards. Blue Cross Blue Shield of Michigan Member ID Cards (PDF) - Brochure with Blue Cross product information for providers, including images of the various member ID cards. Blue Cross and BCN Provider Systems and Web Resources Guide (PDF) - Two-page flyer detailing the computer systems used by provider offices and where to find information on the public and secured websites. Our centers of excellence program is called Blue Distinction Centers for Specialty Care®. The Blue Distinction Specialty Care designation recognizes health care facilities and other providers that demonstrate proven expertise in delivering safe, effective and cost-efficient care for select specialty areas. This program assists consumers in finding quality specialty care nationwide while encouraging health care providers to improve the overall quality and delivery of specialty care. For more information, go to the Blue Distinction Center page on bcbsm.com. More information on bariatric surgery for BCN members is available on the Bariatric Surgery page on this website. We're making changes to the Medicare Plus BlueSM PPO and BCN AdvantageSM Part B specialty prior authorization drug list. The following medications are being added to the list. We also require prior authorization when you bill electronically through an 837I transaction or using a UB04 claim form for a hospital outpatient type of bill 013x. For BCN Advantage, if you have access to Provider Secured Services, you already have access to enter authorization requests through Novologix. For Medicare Plus Blue, you can fax an Addendum P form to gain access to the Novologix online web tool. "The case is unavailable because it's being reviewed. Please try again later." Recently, e-referral began displaying these messages when a provider tries to edit a case that's locked because our Utilization Management team is working on it. This error message can appear for any Blue Cross Blue Shield of Michigan or Blue Care Network case in the e-referral system, including commercial and Medicare Advantage cases. If you encounter one of these messages, we ask that you edit the case later to give our team time to review and exit the case. If you encounter another type of other error message, contact the Web Support Help Desk at 1-877-258-3932. Starting Feb. 25, 2019, e-referral's home-page dashboard will only display new or updated cases from the previous 60 days. This change applies to all Blue Cross Blue Shield of Michigan and Blue Care Network cases in the e-referral system, including commercial and Medicare Advantage. Your cases will display faster on the home page. This will be especially helpful if you typically have a lot of cases. We don't delete cases that are past the 60-day-display time frame. You can access all of your cases by searching for them with the reference number or the member's contract number. Blue Cross and BCN will continue to make enhancements to the e-referral system to make it easier to use. Watch for future web-DENIS messages and news items on the ereferrals.bcbsm.com website announcing upcoming updates. Starting June 1, 2019, our new vendor, naviHealth, will manage authorizations for Medicare Plus BlueSM PPO and BCN AdvantageSM members who require a transfer from an acute inpatient facility to a skilled nursing, long-term acute care or inpatient rehabilitation facility. naviHealth will be reviewing both in- and out-of-state post-acute care cases. Look for upcoming articles in The Record and BCN Provider News on training opportunities and how to submit naviHealth requests. Blues Brief has a new look and is now available via email subscription. Blues Brief is a quick summary of headlines that reference more in-depth articles found in the BCN Provider News or The Record. Keep in mind that Blues Brief is not intended to be a replacement for BCN Provider News or The Record. The e-referral User Guides and Submitting an Outpatient Authorization online eLearning module have been updated on the Training Tools page of ereferrals.bcbsm.com. They are dated November 2018. The new Place of Service drop-down menu items. The Outpatient Hospital option has now been split into On Campus Outpatient Hospital and Off Campus Outpatient Hospital. Other Unlisted Facility and Telehealth have also been added as choices but providers should not use these. A page has been added with instruction on completing a new questionnaire when submitting to a multispecialty group in the Submitting a Global Referral chapter. An e-referral news message has also been posted regarding the questionnaire. Note: eviCore already manages procedures associated with code A9606 for Blue Cross PPO and Medicare Plus Blue members. eviCore will begin managing procedures associated with code C9513 on Feb. 1. Note: Lutathera was previously managed for BCN HMO members under the prior authorization program for drugs covered under the medical benefit. eviCore already manages procedures associated with code C9513 for BCN Advantage members. For BCN HMO members, C codes aren't payable. However, services associated with the administration of an approved treatment plan with Lutathera are payable for BCN HMO members. eviCore will begin managing procedures associated with code A9606 for both BCN HMO and BCN Advantage on Feb. 1. Submit authorization requests to eviCore online at evicore.com or by telephone at 1-855-774-1317. We'll update the Procedures that require authorization by eviCore healthcare document prior to the effective date of the change. Note: These changes do not apply to MESSA members. For most of these services, you'll see the updated questionnaires in the e-referral system starting Nov. 25, 2018. You'll see the questionnaire for shoulder replacement surgery starting Nov. 11. Note: The criteria and questionnaires for endometrial ablation and cervical spine surgery apply to BCN HMO and BCN Advantage members only. For BCN documents — Click BCN, then click Authorization Requirements & Criteria. Next, look in the "Authorization criteria and preview questionnaires" section. For Medicare Plus Blue documents — Click Blue Cross, then click Authorization Requirements & Criteria. Next, look in the "For Blue Cross Medicare Plus Blue PPO members" section. You can look over the preview questionnaires to see what questions you'll need to answer in the actual questionnaire that opens in the e-referral system for each service. Once you know what questions you'll need to answer, you can prepare your answers ahead of time. This can cut down on the time it takes to submit the authorization request. Some updates are coming for the Part B medical specialty medical prior authorization drug list for Blue Cross Medicare Plus BlueSM PPO and BCN AdvantageSM members. These changes include additions and removals from the prior authorization program as follows. We do not require authorization for these medications when you bill them on a facility claim form (such as a UB04) or electronically via an 837I transaction. You must get authorization prior to administering these medications. Use the Novologix® online web tool to quickly submit your requests. You'll see the updated questionnaires in the e-referral system starting Oct. 28, 2018. Note: The criteria and questionnaires for hyperbaric oxygen therapy and lumbar spine surgery apply to BCN HMO and BCN Advantage members only. Learn about the safe and effective use of Avastin for retinal disorders and how to correctly bill Medicare Plus BlueSM PPO and BCN AdvantageSM for maximum reimbursement. Thursday, Dec. 6, 2018, 1 to 1:30 p.m.
Once the host approves your registration, you'll receive a confirmation email with instructions for joining the session. These changes don't apply to BCN AdvantageSM, Blue Cross Medicare Plus BlueSM PPO or Federal Employee Program® members. Submit authorization requests prior to the start of services for medical benefit drugs that require authorization using the NovoLogix® web tool within Provider Secured Services. Approval of a prior authorization request isn't a guarantee of payment. You need to verify each member's eligibility and benefits. Members are responsible for the full cost of medications not covered under their medical benefit coverage. Your feedback is important to us. Please complete the 2018 Blue Cross Blue Shield of Michigan and Blue Care Network Utilization Management Survey and encourage your office colleagues to do so as well, including physicians, nurses and referral coordinators. Your input will help us evaluate our efforts and determine other improvements we can make to enhance our utilization management processes. The survey will be available online through Dec. 31, 2018. Information about a drawing for two $250 gift certificates is available on page 18 of the September-October 2018 issue of BCN Provider News. Internet Explorer, Google Chrome and Mozilla Firefox have announced that new versions of their Internet browsers, being introduced on Oct. 16, 2018, will not trust Symantec certificates. The browsers will display a block page explaining that the site is categorized as "untrusted." If you are a Windows 7 user, you may see a certificate error message starting Oct. 16 when you try to access e-referral. If you do see a certificate error message, please complete the following steps (PDF), reopen your browser and access e-referral. If you are still experiencing issues after following the steps, please contact your web support team. Starting Jan. 1, 2019, when requesting authorization for Eylea®, Lucentis® or Macugen® for Medicare Advantage members, you'll need to show you've already tried eye injections with compounded Avastin (bevacizumab). Look for more information, including billing instructions, in upcoming issues of The Record and BCN Provider News. This change follows Centers for Medicare & Medicaid Services guidance for allowing Part B specialty drug step therapy. And, it applies to Blue Cross Medicare Plus BlueSM PPO and BCN AdvantageSM members for dates of service on or after Jan. 1, 2019. In the new year, according to Centers for Medicare & Medicaid Services guidance, certain Medicare Part B specialty drugs will have additional step therapy authorization requirements. This will apply to Medicare Plus BlueSM PPO and BCN AdvantageSM members for dates of service on or after Jan. 1, 2019. Step therapy is treatment for a medical condition that starts with the most preferred drug therapy and progresses to other drug therapies only if necessary. The goal of step therapy is to encourage better clinical decision-making. We encourage you to send prior authorization requests for Medicare Part B specialty drugs through the NovoLogix web tool via Provider Secured Services. It's the most efficient way to get a determination. Look for more information on step therapy requirements in upcoming issues of The Record and BCN Provider News. Wednesday, Oct. 3, 2018, 1 to 2 p.m.
Friday, Oct. 5, 2018, 10 to 11 a.m. The updated questionnaires will begin opening in the e-referral system starting Sept. 23, 2018. Note: The criteria and questionnaire for cervical spine surgery apply to BCN HMO and BCN Advantage members only. A significant number of contracted providers refer members to out-of-network laboratories. This puts members at risk of having to pay higher costs. Since the tests are available at in-network labs, these costs are unnecessary. Please follow the conditions of your provider agreement and the directions in our provider manuals, which require you to refer these members to in-network labs. Give your patients convenient access to high-quality, cost-efficient toxicology testing services that properly meet their clinical needs. Help our members avoid higher copayments and other out-of-pocket costs that may result from using out-of-network labs. For salaried employees covered through Ford, General Motors and the Michigan Public School Employees' Retirement System, call: Quest DiagnosticsTM – 1-866-697-8378. For all other Blue Cross PPO members, use the Blue Cross online provider directory. Call Joint Venture Hospital Laboratories at 1-800-445-4979. Professional providers in Michigan, call 1-800-344-8525. Facility providers in Michigan, call 1-800-249-5103. After confirming member benefits using the automated system, you can speak to someone in Provider Inquiry to get help finding an in-network lab. The FAQ document is intended to clarify questions about LLP and LMFT requirements related to providing services to Blue Cross PPO (commercial), BCN HMOSM (commercial) and BCN AdvantageSM members. We announced this change in The Record (March 2018 article) and BCN Provider News (January-February 2018 issue, article on page 1). A link to the FAQ document is also located on Blue Cross Clinical Criteria & Resources page within Provider Secured Services. To access that page, visit bcbsm.com/providers, log in to Provider Secured Services and click BCBSM Provider Publications and Resources at the lower right. Then click Clinical Criteria & Resources. Finally, scroll down and look in the "Behavioral Health Information" section of the page, under "General Resources." The updated questionnaires began opening in the e-referral system starting Aug. 26, 2018. The updated questionnaires began opening in the e-referral system starting Aug. 12, 2018. Between Aug. 6 and Aug. 10, 2018, we received reports of an issue in the e-referral system that was preventing providers from viewing certain cases. Some providers told us they had received a message that said "Unknown Error. Please contact health plan administrator." The issue, which occurred when the e-referral system was recently updated to the 2018 InterQual® criteria, has been resolved. We apologize for any confusion you may have experienced when you got the error message. We communicated in June that Blue Cross Blue Shield of Michigan and Blue Care Network would implement the 2018 InterQual criteria and local rules starting Aug. 1, 2018, for all levels of care. However, the implementation of the 2018 criteria was delayed. The new implementation date is Aug. 6. Until that date, the 2017 InterQual criteria and local rules will continue to be used in making utilization management and care management determinations for the services subject to review. Note: Determinations on Blue Cross PPO (commercial) behavioral health services are handled by New Directions, a Blue Cross vendor, and are not affected by these criteria changes. For Blue Cross requests, call the critical phone line at (313) 448-3619. For BCN requests, call 1-800-392-2512. For BCN post-acute and concurrent admission reviews, follow the current process you use to submit these requests by fax at 1-866-534-9994. For BCN behavioral health requests, call 1-800-482-5982. For Blue Cross Medicare Plus Blue PPO behavioral health requests, call 1-888-803-4960. For non-urgent authorization requests: Please wait to submit those until the e-referral system is available again. Starting Aug. 6, 2018, Blue Care Network and Blue Cross Medicare Plus BlueSM PPO will use the 2018 InterQual® criteria for behavioral health utilization management determinations. The 2017 InterQual criteria will be used until that date. Note: In earlier messages, we communicated that the 2018 InterQual criteria would be implemented starting Aug. 1, 2018, but that date has been changed to Aug. 6. For certain services, we will base utilization management decisions on modified 2018 InterQual criteria, local rules or medical policies, instead. These changes will also begin Aug. 6. The services affected by these changes are outlined in this table. Note: Determinations on Blue Cross PPO (commercial) behavioral health services are handled by New Directions, a Blue Cross vendor. Links to the updated versions of the modified criteria, local rules and medical policies will be available by Aug. 3 on the Blue Cross Behavioral Health page and the BCN Behavioral Health page on this website. Links to the current criteria are available on those pages until then. Blue Cross Blue Shield of Michigan and Blue Care Network will implement the 2018 InterQual criteria starting Aug. 6, 2018, for all levels of care. Until that date, the 2017 InterQual criteria will be used. For behavioral health determinations, the 2018 local rules will be used starting Aug. 6. The updated rules will be available by Aug. 3 on the Blue Cross Behavioral Health page and the BCN Behavioral Health page on this website. This applies to BCN HMO (commercial), BCN Advantage and Medicare Plus Blue PPO requests. For non-behavioral health determinations, the 2018 local rules will be implemented starting Oct. 1. We'll let you know through our standard communication channels how to access those rules, once they're available. Until the 2018 local rules are implemented, the 2017 local rules will be used. Time is running out to give us your opinion on provider training. You have until July 31 to complete our online survey. Your response will help us improve the way we distribute information to you. Thank you for your time and your input. When you submit an authorization request in the e-referral system, it may take up to a minute to show the authorization results, especially if the system is handling many requests at one time. While you're waiting to get the decision on an authorization request, the e-referral system may display messages that conflict with each other. For example, the Authorization Details screen may show a status of "pending decision" along with a note in the Actions field that shows the request was approved. If you encounter conflicting messages such as these, we suggest you make a note of the Reference ID number and use it to check back in a few minutes. This should give the system the time it needs to finish processing the authorization and display the decision without the conflicting messages. In an article in the July-August 2018 Hospital and Physician Update, we provided an update on Blue Distinction Specialty Care. This program recognizes health care facilities and providers nationwide that demonstrate proven expertise in delivering high-quality, effective and cost-efficient care for select specialty areas. The article outlines selection criteria and recent program changes, along with information on what's coming next and program results. For complete details, click here. This information applies to both Blue Cross PPO (commercial) and Blue Care Network HMOSM (commercial) members. The article that was published in Hospital and Physician Update will also be included in the September-October 2018 issue of BCN Provider News, which will be available online in late August. The e-referral system is available again. After an outage of the e-referral system, you may experience difficulties logging in to the system. Deleting your browsing history may make the login process easier. Click here for instructions on how to delete your browsing history if you use Internet Explorer 11 as your browser. If you use a browser other than Internet Explorer 11, contact your IT support staff for instructions or look up how to clear your browsing history on the Internet. Blue Cross Blue Shield of Michigan and Blue Care Network allow onsite physician advisors at contracted facilities to discuss reviews of inpatient admissions with a Blue Cross or BCN medical director. According to our policy, facilities should start peer-to-peer conversations only through their employed physician advisors, and not through third-party advisors or organizations. This applies to members with coverage with Blue Cross PPO (commercial), BCN HMOSM (commercial), Blue Cross Medicare Plus BlueSM PPO and BCN AdvantageSM products. The purpose of the peer-to-peer discussion is to exchange information about the clinical nuances of the member's medical condition and the medical necessity of the inpatient admission, not to discuss InterQual® criteria or Blue Cross and BCN local rules. The peer-to-peer phone lines are open Monday through Friday, 8 a.m. to 5 p.m. Eastern time, except for holidays. We'll return your call within 48 business hours. Use the following guidelines to request a peer-to-peer review with a Blue Cross or BCN medical director. Select prompt 3 for a peer-to-peer discussion. Select prompt 1 to request a provider peer-to-peer review. For Blue Cross PPO (commercial) members: Call the behavioral health number on the back of the member's ID card. For dates of service on or after Oct. 1, 2018, Trogarzo and Zilretta will be added to the medical drug prior authorization program for Blue Cross PPO (commercial) and BCN HMOSM (commercial) members. Trogarzo will also be subject to a site-of-care requirement for BCN HMO (commercial) members only, effective Oct. 1, 2018. The site-of-care program redirects members receiving select drugs in an outpatient hospital setting to a lower-cost, alternate site of care, such as the physician's office or the member's home. See the table below for a summary of the requirements. For members currently on Trogarzo, no action is required. For members currently on Zilretta, authorization will be required for dates of service on or after Oct. 1, 2018. Log in to Provider Secured Services. Click BCBSM Provider Publications and Resources. Click BCBSM Medical Drug Prior Authorization Program list of groups that have opted out. And remember: approval of an authorization request isn't a guarantee of payment. Health care practitioners need to verify eligibility and benefits for members. Members are responsible for the full cost of medications not covered under their medical benefits. Additional information on medical benefit drugs is available at ereferrals.bcbsm.com, on the Blue Cross Medical Benefit Drugs — Pharmacy page and the BCN Medical Benefit Drugs — Pharmacy page. Starting Aug. 1, 2018, Blue Care Network and Blue Cross Medicare Plus BlueSM PPO will use the 2018 InterQual® criteria for behavioral health utilization management determinations. The 2017 InterQual criteria will be used through the end of July. For certain services, we will base utilization management decisions on modified 2018 InterQual criteria, local rules or medical policies, instead. These changes will also begin Aug. 1. The services affected by these changes are outlined in this table. Links to the updated versions of the modified criteria, local rules and medical policies will be available at the end of July on the Blue Cross Behavioral Health page and the BCN Behavioral Health page on this website. Links to the current criteria are available on those pages until then. Click here for a list of the authorization criteria and questionnaires that were updated in May and June 2018. Links to the BCN documents are on the BCN Authorization Requirements & Criteria page. Look in the section titled "Authorization criteria and preview questionnaires." Links to the Medicare Plus Blue documents are on the Blue Cross Authorization Requirements & Criteria page. Look in the section titled "For Blue Cross Medicare Plus Blue PPO members." As a reminder, new questionnaires will open in the e-referral system for blepharoplasty and repair of brow ptosis (starting June 25, for any date of service) and hyperbaric oxygen therapy (for dates of service on or after July 1). We first communicated about this in May, in a web-DENIS message and a news item on this website. You'll see these questionnaires included in the list of updated authorization criteria and questionnaires. Blue Cross Blue Shield of Michigan and Blue Care Network will implement the 2018 InterQual criteria starting Aug. 1, 2018, for all levels of care. Until that date, the 2017 InterQual criteria will be used. For behavioral health determinations, the 2018 local rules will be used starting Aug. 1. The updated rules will be available at the end of July on the Blue Cross Behavioral Health page and the BCN Behavioral Health page on this website. This applies to BCN HMO (commercial), BCN Advantage and Medicare Plus Blue PPO requests. Recently, the Web Support Help Desk has been experiencing an increase in calls for e-referral assistance. As a reminder, the Web Support Help Desk is only available to assist with password reset, navigation and technical help. For Blue Cross PPO (commercial) members, you can find the appropriate Provider Inquiry phone number in the Blue Cross provider resource guide at a glance document, on the Quick Guides page of this website. For Blue Cross Medicare Plus BlueSM PPO members, you can find the appropriate Provider Inquiry phone number in the Services That Require Authorization – Medicare Plus Blue PPO document, on the Authorization Requirements & Criteria page in the Blue Cross section of this website. For BCN HMOSM (commercial) or BCN AdvantageSM members, please call 1-800-392-2512. For additional help using e-referral, contact your provider consultant or consult the user guides and online training available on the Training Tools page on this website. This authorization requirement applies to Blue Cross Medicare Plus BlueSM PPO and BCN AdvantageSM members. Note: Authorization is already required for Blue Cross PPO and BCN HMOSM (commercial) members. Authorization is not required for these medications when they are billed on a facility claim form (such as the UB-92, UB-04 or UCB). Both medications are billed with HCPCS procedure code J3590. You must submit authorization requests for these medications through the NovoLogix online tool. Authorization must be obtained prior to the medications being administered. Several new upgrades and changes are coming to the e-referral system. The biggest change is the combining of BCN and BCBSM e-referral systems into one portal. In order to upgrade the system, e-referral will not be available starting 6 p.m. on Friday, April 27, 2018. At 6 a.m. on Monday, April 30, 2018, users will see only one e-referral link to be used for both Blue Cross and BCN submissions. Please see the article on page 42 of the May-June 2018 BCN Provider News for full details. Here's some information on how to process certain requests while the e-referral system is down. For BCN requests, call the BCN After-Hours Care Manager Hotline at 1-800-851-3904. To reach BCN Behavioral Health, call 1-800-482-5982. We're clarifying the requirements for notifying Medicare Advantage members using the Medicare Outpatient Observation Notice form. For Medicare Advantage members in these circumstances, hospitals must present the member with a completed Medicare Outpatient Observation Notice. This is a Centers for Medicare & Medicaid Services requirement. Hospitals should also review the instructions for notifying members using the Medicare Outpatient Observation Notice. When Blue Cross or BCN has approved an inpatient admission, there's no need to notify the member using the form. When the member is not being considered for inpatient care, there's no need to notify either the member or the plan. *Blue Cross Blue Shield of Michigan doesn't own or control this website. For dates of service on or after June 1, 2018, diabetic shoes and inserts will be managed by Northwood, Inc., for Blue Care Network HMOSM (commercial), BCN AdvantageSM and Blue Cross Medicare Plus Blue PPO members. This applies to HCPCS codes A5500 through A5513 and code K0903. J&B Medical Supply currently manages these items and will manage them for dates of service on or before May 31, 2018. Northwood: Call Northwood at 1-800-393-6432 to identify a contracted supplier near you. The supplier submits the request to Northwood for review. Northwood representatives are available weekdays from 8:30 a.m. to 5 p.m. Northwood on-call associates are available after normal business hours at the same number. J&B Medical Supply: Call J&B at 1-888-896-6233. J&B representatives are available weekdays from 8 a.m. to 5 p.m. J&B on-call associates are available after normal business hours at the same number. We'll be updating the BCN and Blue Cross Medicare Plus Blue PPO provider manuals to reflect the changes related to diabetic shoes and inserts. Time is running out to give us your opinion on our provider manuals. Please complete our online survey by April 30. You could win a $25 gift certificate. For more information see recent articles in The Record and page 13 of BCN Provider News. Earlier this year, we notified you and members that Blue Cross and Blue Care Network will no longer cover hyaluronic acids beginning April 1. After further review, we've decided to continue covering hyaluronic acids while we conduct additional research. We hope to have a final decision in the next few months and will continue to update you on this critical initiative. Members will receive a letter soon with the updated information. As a reminder, effective for dates of service on or after April 2, 2018, all non-emergency air ambulance transports for Blue Cross Blue Shield of Michigan PPO (commercial) and Blue Care Network HMOSM (commercial) members require authorization. Requests to authorize non-emergency flights must be submitted to and approved by Alacura Medical Transportation Management, LLC, prior to the flight. This requirement applies to both in-state and out-of-state air ambulance transports. Emergency flights – when the patient cannot safely wait six hours to take off – do not require authorization. This includes situations that involve delays due to weather or stabilizing the patient. When it's an emergency, just transport the patient. Complete the Air ambulance flight information (non-emergency) form and fax it, along with clinical documentation in support of the request, to Alacura at 1-844-608-3572. Call Alacura at 1-844-608-3676 to obtain an authorization number. You'll find additional information about air ambulance requirements on page 2 of the Air ambulance flight information (non-emergency) form and in upcoming issues of The Record and BCN Provider News. The Blue Cross and BCN provider manuals are also being updated. We're working to improve our service to you and would like your opinion on our provider manuals. Please complete our online survey by April 30. You could win a $25 gift certificate. For more information, see recent articles in The Record and BCN Provider News. Blue Cross Blue Shield of Michigan and Blue Care Network's 2018 provider forums begin in May. You can register for the full day or choose to attend just the morning or afternoon session. Dates, times, locations and registration information can be found on our provider forum flyer (PDF). HEDIS® is a registered trademark of the National Committee for Quality Assurance, or NCQA. Complete the Medication Authorization Request Form on this page for the medication you're requesting. Fax the completed form and the clinical documentation to 1-866-392-6465. Since these requests require thorough review, we ask that you request an expedited review only if the standard review time frame could place the member's health in serious jeopardy. When submitting authorization requests for knee arthroplasty procedures in an outpatient setting, you may see a message in the e-referral system indicating "Procedure is not appropriate for treatment setting." Here's what to do: Please ignore the message and proceed with the outpatient authorization request. This applies to procedure codes *27446 and *27447, for BCN HMOSM (commercial), BCN AdvantageSM and Blue Cross Medicare Plus BlueSM members. This year, the Centers for Medicare & Medicaid Services began allowing knee arthroplasty procedures to be done in an outpatient setting. The e-referral system will accept those authorization requests but it's displaying the message that makes it seem like it won't. We're getting many calls from providers asking what they should do. The e-referral system is being adjusted to stop displaying the message, but the update won't be completed until sometime in April. At that time, you'll no longer see the "Procedure is not appropriate for treatment setting" message when submitting outpatient knee arthroplasty authorization requests. Meanwhile, ignore the message and proceed with the outpatient request. We appreciate your patience as we update the e-referral system. *CPT codes, descriptions and two-digit numeric modifiers only are copyright 2017 American Medical Association. All rights reserved. Effective for dates of service on or after April 2, 2018, all non-emergency air ambulance transports for Blue Cross PPO (commercial) and Blue Care Network HMOSM (commercial) members require authorization. Requests for authorization must be submitted to Alacura Medical Transportation Management, LLC, prior to the flight. Information about the process to use in submitting these requests will be made available closer to the April effective date. This requirement applies to both in-state and out-of-state air ambulance transports. Blue Cross and BCN are partnering with Alacura to provide review of non-emergency air ambulance flights. Alacura will use the Blue Cross and BCN medical policy titled Air Ambulance Services to determine the appropriateness of non-emergency flights. There are no changes to member benefits related to air ambulance services. Non-emergency air ambulance services are eligible for reimbursement if the member has the benefit and if Alacura authorizes the flight. Reason for this change: Air ambulance transports that are not medically necessary or that are flown by noncontracted providers expose Blue Cross and BCN members to significantly greater out-of-pocket costs and are much costlier for the plan. The requirement for authorization prior to non-emergency flights is expected to lower costs for Blue Cross and BCN members and customers. Billing air ambulance claims: As a reminder, instructions for billing emergency and non-emergency air ambulance services for dates of service on or after Jan. 1, 2017, are now available. For the details, see the web-DENIS message posted Jan. 12, 2018, titled "Air ambulance billing instructions are now available." Blue Cross Blue Shield of Michigan PPO (commercial) and Blue Care Network HMOSM (commercial) plans won't cover hyaluronic acids, beginning April 1, 2018. Hyaluronic acids, also known as viscosupplements, are used to treat osteoarthritis of the knee. Effective April 1, 2018, the following hyaluronic acids will be considered investigational and won't be covered for Blue Cross and BCN commercial (non-Medicare) members. Behavioral health medical record documentation requirements are now available online. These requirements apply across all lines of business (Blue Cross PPO, Blue Cross Medicare Plus BlueSM PPO, BCN HMOSM and BCN AdvantageSM). The requirements are available on this website, on both the Blue Cross Behavioral Health page and the BCN Behavioral Health page. Professional, hospital and facility behavioral health providers contracted with Blue Cross or BCN must follow these requirements when documenting behavioral health services provided to our members. One set of guidelines is for applied behavior analysis services. The other set applies to non-ABA services. In the November 2017 issue of The Record, see the article Behavioral health documentation guidelines now available. In the November-December 2017 issue of BCN Provider News, see the article Behavioral health documentation guidelines now available. The e-referral site was honored recently with two awards from the International Association of Business Communicators. Locally, the site received a Detroit Renaissance Award of Merit in Digital Communications. The Detroit chapter includes professional communicators from southeast Michigan. At a regional level, the site received a Silver Quill Award of Merit from the IABC Heritage Region, which includes 17 states and the District of Columbia. The e-referral redesign was the only project from Michigan to receive this prestigious award. Congratulations to the team behind the award-winning e-referral site. Michigan Medicine's MedEQUIP provider of durable medical equipment is not accepting new patients as of Oct. 20, 2017. This is a temporary situation. Please see the MedEQUIP website for any exceptions and the latest information. Blue Cross Blue Shield of Michigan and Blue Care Network will implement the 2017 InterQual® criteria starting Oct. 2, 2017, for all levels of care. These criteria are used to make utilization management and care management determinations for the services subject to review. Until that date, the 2016 InterQual criteria will be used. In addition, starting October 2, Blue Cross and BCN will implement their local rules. Until that date, the 2016 local rules will be used. Click Clinical Criteria & Resources. Scroll down to the heading "BCBSM modifications to InterQual criteria." Click 2017 BCBSM modifications to InterQual criteria. To access the 2017 BCN Local Rules, visit BCN's Clinical Review & Criteria Charts page on this website and click BCN's current Local Rules. As a reminder, implementation of the 2017 criteria and local rules was delayed due to upgrades being made to the e-referral system. While the eviCore call centers, located in Florida and South Carolina, may be affected by Hurricane Irma, the online portal will remain fully operational. You are encouraged to use the online portal at evicore.com to initiate authorization requests and check case status until the area has recovered. Calls will continue to be answered, but you may experience longer phone hold times or other issues. As a reminder, Blue Cross Blue Shield of Michigan and Blue Care Network will delay implementing the 2017 InterQual® criteria until October 2017. This delay is due to upgrades being made to the e-referral system. Until these upgrades are complete, we will continue to follow the 2016 InterQual criteria for all levels of care. When we have a new date for implementing the 2017 criteria, we'll let you know through our standard channels of communication. Providers who need to contact the Pharmacy Clinical Help Desk about drugs covered under the medical benefit should call 1-800-437-3803, effective July 5, 2017. This applies to members covered through BCN HMOSM (commercial), BCN AdvantageSM and Blue Cross Medicare Plus BlueSM PPO products. Providers who have been using other numbers to contact the Pharmacy Clinical Help Desk for drugs covered under the medical benefit should begin using the 1-800-437-3803 number effective July 5, 2017. All other numbers to the Pharmacy Clinical Help Desk will be discontinued as of July 5, 2017. Blue Cross Blue Shield of Michigan and Blue Care Network will delay implementing the 2017 InterQual® criteria until October 2017. This delay is due to upgrades being made to the e-referral system. Providers who bill for drugs covered under the medical benefit for their Blue Cross and Blue Care Network commercial members are encouraged to review the additional information now available on the RC Claim Assist tool. Additional provider webinars on the RC Claim Assist tool will be scheduled later in 2017. In the meantime, you should review the information currently available, register for the tool and begin using it. Click here to register for RC Claim Assist or to log in, if you are already registered. Click to open our webinar invitation and sign up to attend one of the RC Claim Assist training webinars we're hosting on March 14, 2017. How do I access RC Claim Assist? Create your unique password when you are prompted to do so. RC Claim Assist should be used only for claims submitted for Blue Cross Blue Shield of Michigan and Blue Care Network commercial members. For questions about billing or claims, contact Provider Inquiry. For questions about a claim that are contractual or complex in nature, contact your provider consultant. *CPT codes, descriptions and two-digit numeric modifiers only are copyright 2016 American Medical Association. All rights reserved. You can now train on e-referral at your own speed. Go to the Training Tools page and look for Online self-paced learning modules in the Online training section. While you're there, check out the other training tools available to you. You've probably already noticed things have changed. On our new site, to find the BCN information you've used in the past, just click "BCN" along the top or at the left of any page. You'll find all of the BCN-related referral and authorization information in the section that opens. As time goes on, more information will be added to the Blue Cross section of the website. When you first enter ereferrals.bcbsm.com, you're in the Home area where you’ll find pages like Provider Search and Quick Guides. This is information that may apply to both BCN and Blue Cross. When a page first displays in the Home section, all BCN and Blue Cross information is visible. To see information specific to a certain line of business, click either the Blue Cross or the BCN filter button at the top of the content section. To see all of the information again, click "Show All." When you access one of these pages from within the BCN or Blue Cross section, though, only the information relevant to that line of business will be displayed and no filter buttons will appear. The new ereferrals.bcbsm.com site also includes a Search feature. Look in the upper right part of the page. You can choose to search the Full Site or just the BCN or Blue Cross sections of the site. Enter your search term, select where you want to search from the drop-down, and click "Go." Thank you to those who participated in the survey held earlier this year. Your input was used to determine some of the enhancements made to the site. If you have comments, please send us feedback. Blue Cross Blue Shield of Michigan and Blue Care Network corporate offices will close on Friday, April 19, 2019, for their Good Friday corporate holiday. Acute initial inpatient admissions Submit requests 24/7 through the e-referral system. Or, you can submit them through the X12N 278 Health Care Services Review - Request for Review and Response electronic standard transaction. Fax requests to eviCore healthcare at 1-844-407-5293. Urgent inpatient requests only Call the Blue Cross after-hours urgent hotline at 313-448-3619. 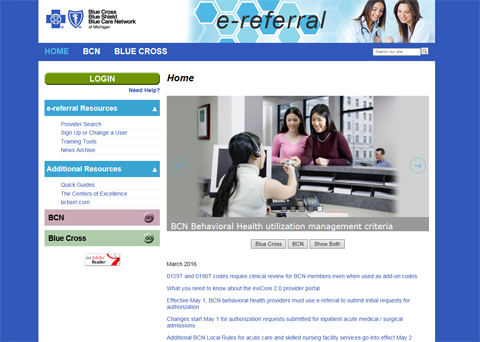 Find additional e-referral system resources at ereferrals.bcbsm.com. Effective July 1, KhapzoryTM and Fusilev® will be added the prior authorization program for PPO commercial members. Effective July 1, 2019, KhapzoryTM and Fusilev® will be added to the Medical Drug Prior Authorization Program for Blue Cross Blue Shield of Michigan PPO commercial members. This applies to any members starting therapy on or after July 1. These drugs are currently included in the prior authorization program for Blue Care Network HMOSM commercial members. The authorization requirement only applies to groups that are currently participating in the commercial Medical Drug Prior Authorization Program for drugs administered under the medical benefit. These changes don't apply to BCN AdvantageSM, Blue Cross Medicare Plus BlueSM PPO or Federal Employee Program® members. A prior authorization approval isn't a guarantee of payment. Health care practitioners need to verify eligibility and benefits for members. Members are responsible for the full cost of medications not covered under their medical benefit coverage. Visit the Medical Benefit Drugs - Pharmacy page in the Blue Cross section at on this website. Click Requirements for drugs covered under the medical benefit - BCN HMO and Blue Cross PPO under the heading For Blue Cross (commercial) members. The new prior authorization requirement for Khapzory and Fusilev will be reflected in the requirements list before the July 1 effective date. As of March 1, 2019, all UAW Retirees' Medical Benefits Trust's Blue Cross non-Medicare members, regardless of where they live, need prior authorizations through AIM Specialty Health for the services listed below. *In-lab sleep auths are only required by providers practicing in the state of Michigan. Reach AIM Specialty Health at 1-800-728-8008 or visit AIMspecialtyhealth.com. As of Jan. 28, 2019, Medicare Plus Blue PPO facility claims billed for Prolastin and Aralast (with HCPCS J0256, sent via electronic institutional format 837I or paper UB-04 form) no longer deny for lack of medical documentation. This is regardless of the date of service. Also, we've begun working on 2019 prior-authorization requirements (for electronic or paper facility claims) for certain specialty medical drugs, including Prolastin and Aralast. We'll share more information about this over the next few months. Blue Cross Blue Shield of Michigan and Blue Care Network corporate offices will close on Monday, Jan. 21, 2019, for Martin Luther King, Jr., Day. Or, you can submit them through the X12N 278 Health Care Services Review – Request for Review and Response electronic standard transaction. Urgent inpatient requests only Call the Blue Cross after-hours urgent hotline at 313-448-3619 for any immediate or urgent need. Find additional e-referral system resources elsewhere on this website. Register now for an AIM Specialty Health® ProviderPortalSM webinar. Beginning Jan. 1, 2019, Blue Cross Blue Shield of Michigan will implement two new utilization management programs for oncology services for UAW Retiree Medical Benefits Trust (URMBT), non-Medicare members. With these programs, prior authorization must be obtained through AIM Specialty Health for some outpatient medical and radiation oncology treatments. The programs require prior authorization for radiation oncology and medical oncology services in outpatient settings. Sign up for a webinar to hear an overview of the program and learn how to access the AIM system and how the submission process works. The webinars listed are split between medical oncology and radiation oncology for clinical and non-clinical staff. To register, click here. Once the host approves your registration, you'll receive a confirmation email with instructions for joining the session. For more information, see the article in the October 2018 issue of The Record. During these holiday closures, the Blue Cross inpatient utilization management area remains available to accept inpatient authorization requests for Blue Cross PPO (commercial) and Blue Cross Medicare Plus BlueSM PPO members. See the table below for instructions on submitting inpatient authorization requests when our corporate offices are closed. Post-acute initial and concurrent admission reviews Follow the current process and fax to 1-866-411-2573. Follow the current process and fax to eviCore healthcare 1-844-407-5293. Urgent inpatient requests only Call the Blue Cross after-hours urgent hotline at 313-448-3619 for any immediate or urgent need. Call the Blue Cross after-hours urgent hotline at 313-448-3619 for any immediate or urgent need. Additional resources related to the e-referral system are found elsewhere on this website. In this course, you'll refresh your skills with the NovoLogix® web tool, and learn how to create prior-authorization requests for provider-administered specialty medical drugs. *In July 2017, Blue Cross Medicare Plus Blue PPO launched a prior-authorization program for select provider-administered specialty medical drugs. All providers have the right to appeal an adverse decision made by the Blue Cross Medicare Plus Blue PPO utilization management staff on an inpatient admission authorization request. The instructions for submitting an appeal are within the Blue Cross Medicare Plus Blue PPO Provider Manual (in the Utilization management chapter, and the "Contracted MI Provider Acute Inpatient Admission Appeals" section). Expedited appeals: You may ask for an expedited appeal when circumstances require that we make a decision in a short period of time. To request an expedited appeal, call 1-866-807-4811. Second-level appeals: Send these to us within 21 calendar days of the date noted on the first-level appeal decision. Look for upcoming articles on this topic in The Record. Acute initial inpatient admissions Submit these authorization requests through the e-referral system, which is available 24 hours a day, seven days a week. Submit these authorization requests through the e-referral system, which is available 24 hours a day, seven days a week. Post-acute initial and concurrent admission reviews Follow the current process and fax to 1-866-411-2573. Follow the current process and fax to 1-866-464-8223. Note: Acute initial inpatient admissions may also be submitted through the X12N 278 Health Care Services Review – Request for Review and Response electronic standard transaction. Recently, an error in the e-referral system has been causing Blue Cross outpatient authorization requests that should not have been entered into the system to pend. Upon submission, providers submitting these authorizations in error receive a case ID and a pending message. For Blue Cross Medicare Plus BlueSM PPO, requirements are outlined in the Services That Require Authorization (PDF). Some Blue Cross PPOSM (commercial) member outpatient procedures may require authorization. Visit the eviCore-Managed Procedures page. For Blue Cross PPO (commercial) behavioral health requirements, see the For Blue Cross PPO (commercial) members section on ereferrals.bcbsm.com under Blue Cross then the Behavioral Health section. While this issue is being resolved, we are voiding these cases manually and sending a message to providers why the case has been voided. We invite you to register for one of the educational webinars we're hosting about the upcoming changes to the Medicare Plus Blue specialty medication prior authorization program. You'll learn about how Medicare Plus Blue is expanding its specialty medication authorization requirements to include outpatient facilities that bill with Place of Service 19, 22 or 24. Currently, only providers that bill with Place of Service 11 are subject to these requirements. We first communicated about this change in a web-DENIS message posted on May 1, 2018. Then complete the registration form and fax it to 1-866-652-8983 or email it as an attachment to ProviderInvitations@bcbsm.com. Instructions will be emailed to you a day or two prior to the webinar. Here's what you need to know about submitting inpatient authorization requests to Blue Cross when our corporate offices are closed. Acute initial inpatient admissions. Submit these authorization requests through the e-referral system, which is available 24 hours a day, seven days a week. Post-acute initial and concurrent admission reviews. Follow the current process and fax to 1-866-464-8223. Additional information. You can also call the Blue Cross after-hours urgent hotline at 313-448-3619 for any immediate or urgent need. During these holiday closures, the Blue Cross inpatient utilization management area remains available to accept inpatient authorization requests for Blue Cross PPO (commercial) and Blue Cross Medicare Plus Blue SM PPO members. In December, we told you about an inaccurate response you could receive when submitting an inpatient authorization request through the e-referral system for Blue Cross PPO members from group 71575. This system error has been fixed. Now only Ascension members will generate an (appropriate) e-referral message instructing you to submit their authorization requests through ABS. We apologize for the inconvenience caused by the prior systems error. Effective Dec. 18, 2017, inpatient authorization requests submitted through the e-referral system for Blue Cross PPO members from group 71575 are resulting in an inaccurate response. The response says, "You are not able to submit this request. Requests for Ascension members are managed by ABS. Submit authorization request to ABS PreCert...". If you see this message, please check the member's group number on the ID card. If the group number is 71575, then that member is not an Ascension member and the request should not be submitted to ABS PreCert. We are working to fix this systems error and estimate it will be corrected by Jan. 15, 2018. Until then, we ask that you fax inpatient authorization requests for members from group 71575 to 1-866-411-2585. Remember to include member demographic and clinical information and a contact number in case we have questions. We apologize for the inconvenience caused by this systems error. For services that require authorization by eviCore healthcare for Blue Cross PPO members for dates of service on or after Jan. 1, 2018, don't submit authorization requests until Friday, Dec. 22, 2017. An article in the November 2017 issue of The Record had indicated that requests could be submitted as early as Dec. 18, but eviCore's system won't be ready to accept those requests until Dec. 22. Only sick newborns—not well babies—require inpatient admission authorization from Blue Cross Blue Shield of Michigan. Since newborns take a few days to get added to their parent's health care coverage, and since the e-referral application doesn't allow for temporary requests until the sick baby has coverage, sick newborn inpatient admission authorization requests should be submitted by fax. Use the Acute Inpatient Fax Assessment Form to submit the request for patients with Blue Cross commercial PPO coverage. If the baby is not yet named, you can use "Baby Boy" or "Baby Girl" or, in the case of multiple births, "Baby Boy 1", "Baby Boy 2" as the baby's first name. Our October Record article, Here's what you need to know about Blue Cross inpatient authorization requirements, initially caused some confusion. It listed newborn and gender assignment authorization requests as the only exceptions to using e-referral for submitting Blue Cross inpatient admission authorization requests. We should have said that only sick newborns and gender assignment require inpatient authorization via fax. We updated our October article to clarify this. We apologize for the confusion. On Jan. 1, 2017, we launched our eviCore physical therapy program with the intent of partnering with our provider community to foster better health outcomes for our members. We introduced this initiative by implementing an evidence-based tool delivered by eviCore that we felt would allow providers to offer their patients appropriate care at the right time. We expected the program transition to be a seamless and positive experience for our providers. Unfortunately, the affects of this implementation didn't align with our intent. We apologize for any unnecessary confusion, frustration or inconvenience that you may have experienced during this transition. We truly value your partnership and want to assure you that we've heard your concerns and taken them seriously. As such, we've been working with eviCore to identify solutions to address these concerns. Effective Oct. 1, 2017, we're implementing an interim solution that we hope you'll find satisfactory. When a member has had recent surgery and requires physical therapy as a part of their treatment plan, he or she will be entitled to receive a minimum of 12 visits within 45 days. This approach will allow these members to have two visits per week over the course of six weeks, and gives our providers more time to request approvals for any additional visits they want to have added to a member's treatment plan without creating a lapse in care. If you have any questions regarding the information in this message, please reach out to your provider consultant. Thank you for your continued partnership. Starting Oct. 16, 2017, the way behavioral health facilities submit initial authorization requests, concurrent reviews and discharge summaries for Blue Cross Blue Shield of Michigan Medicare Plus BlueSM PPO members will change. This applies to inpatient, partial hospital and intensive outpatient services. It applies to both substance use and mental health disorders. The changes are summarized in an article in the October 2017 issue of The Record. Addition information is available on the Behavioral Health page in the Blue Cross section of this website. As of July 31, 2017, inpatient admission authorization requests for Blue Cross Blue Shield of Michigan commercial PPO and Blue Cross Medicare Plus Blue® PPO must be submitted through e-referral except for newborn and gender reassignment which must be faxed. See the Blue Cross commercial and Medicare Advantage inpatient authorization requirements table on the Blue Cross Authorization Requirements & Criteria webpage for more information. The application of clinical criteria is required in some cases to receive authorization. Concurrent review will occur for all inpatient admissions for members with Blue Cross Medicare Plus Blue PPO coverage and members with Blue Cross commercial PPO coverage through the UAW Retiree Medical Benefits Trust. Facilities and providers should request an appropriate number of days when submitting their authorization request based on the member's diagnosis and clinical presentation. Requests for additional days must be submitted through e-referral and must include clinical updates. If the member is discharged prior to the last covered day, a discharge date should be entered in e-referral. The discharge date and the total number of days the member was inpatient can be added to e-referral as a note. For instructions on how to do this, see the e-referral User Guide (PDF). Go to the Submitting an Inpatient Authorization section, and review the Create New (communication) instructions. A document titled Frequently asked questions about using the e-referral system has been posted to this website that gives providers important details about submitting authorization requests for services for Blue Cross PPO (commercial) and Blue Cross Medicare Plus BlueSM PPO members. It includes questions and answers emanating from an August 2017 webinar that showed providers how to use the system. We hope this document will prove especially helpful to providers who started making the transition to the e-referral system on July 31, 2017. This was the effective date for submitting Blue Cross authorization requests through the e-referral system instead of through the prenotification system. Additional information on using the e-referral system, including the e-referral User Guide, is available on the Blue Cross Training Tools page on this website. We are receiving authorization requests through the e-referral system for Blue Cross PPO (commercial) members that do not need to be submitted. If you are submitting requests for Blue Cross PPO (commercial) members for procedures identified in the list of Services That Require Authorization as requiring authorization as of July 31, 2017, here's what you need to know: This document applies only to Blue Cross Medicare Plus BlueSM members. Here's a summary of what's required for both sets of members. For Blue Cross Medicare Plus Blue members, professional providers must submit authorization requests through the e-referral system for the procedures listed on the Services That Require Authorization document. Authorization criteria related to these procedures are now available on the Blue Cross Authorization Requirements & Criteria page on this website. For Blue Cross PPO (commercial) members, professional providers should continue to request authorization only for procedures that currently require it, such as the radiology procedures submitted through AIM and a few others. Joint replacements and similar procedures, which require authorization for Blue Cross Medicare Plus Blue members starting July 31, do not require authorization for Blue Cross commercial members. Facility providers should submit authorization requests for inpatient admissions through the e-referral system for dates of service on or after July 31, 2017, instead of using the prenotification system that's been used for these requests in the past. For issues related to Blue Cross commercial member authorizations, please call 1-800-572-3413. For Issues related to Blue Cross Medicare Plus Blue member authorizations, please call 1-866-309-1719. To add a temporary member to Blue Cross commercial, such as a newborn admitted to a NICU, please fax requests to 1-866-411-2585. Beginning July 31, 2017, providers will use the e-referral system instead of the prenotification system for their Blue Cross PPO (commercial) and Blue Cross Medicare Plus BlueSM PPO members. If you've been using the prenote system for services requiring prior authorization (also called authorization or preauthorization), you'll be switching to e-referral. Interested providers are invited to attend an upcoming webinar on July 27 or August 31 for e-referral training. Fill out and submit the webinar invitation. Instructions for signing in to the webinar will be emailed to you prior to the event you sign up for. The Blue Cross® Personal Choice PPO page on this website now has expanded information including upcoming webinars, an FAQ document, an e-referral user guide and more. You can navigate to the Blue Cross Personal Choice PPO page on this site by clicking Blue Cross and then Blue Cross Personal Choice PPO in the Blue Cross Authorizations / Referrals section of the left navigation. Six one-hour webinars are being held to introduce the Blue Cross Personal Choice PPO. You can find more information, including the invitation and how to register on the Blue Cross Personal Choice PPO page of the e-referral site.